Journey into space alongside the astronauts on the space shuttle as they orbit around the Earth, floating as never before over the towering Andes, the boot of Italy, Egypt and the Nile. Witness firsthand a tension-filled satellite capture and repair and the historic first spacewalk by an American woman. DVD: Standard 1.33:1; audio English Dolby Digital 5.1, French Dolby Digital 5.1; subtitles English, Spanish, French, Portuguese; closed-captioned; single sided - single layered; no chapters; not rated; 36 min. ; $19.98; street date 6/12/01. 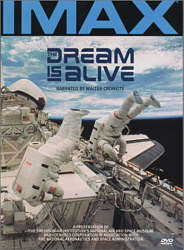 1985’s The Dream Is Alive offers a fine example of what I call “Classic IMAX”. It comes from the period during which IMAX films concentrated on sheer “you are there” realism and didn’t worry about storylines. As such, we found no tales of paleontologists and dinosaurs (T-Rex: Back to the Cretaceous), and we didn’t watch basketball legends as they proceeded through the playoffs (Michael Jordan to the MAX). Nope - Classic IMAX followed the model of one of the format’s earliest pieces, 1976’s To Fly!. That flick provided most of my peers and myself our first glimpse of IMAX, as it was the premier attraction at the then-new National Air and Space Museum in Washington. As residents of the DC suburbs, we were trundled up and taken to that thing umpteen times. Frankly, it burned me out pretty badly; every time Uncle Fred or Aunt Gertie came to town, we’d have to hit the Air and Space Museum and encounter another screening of To Fly!. At this point, it’s been many years since I went through those pains, so my antagonism toward To Fly! has largely dissipated. Actually, in the face of the somewhat strained storytelling of more recent IMAX efforts, I must admit I now feel some fondness toward the simpler titles. As such, I found The Dream Is Alive to be a fairly enjoyable and fun piece of work. The movie documents some space shuttle missions that occurred back in 1984. I suppose one could claim that a loose storyline fits the project, as we seen different aspects of these flights. For example, we witness the minor tension of the first spacewalk accomplished by a woman, and the crewmembers also attempt to repair a satellite. However, the movie never tries to link these with any form of overriding theme, as the emphasis firmly remains on stunning visuals. Despite the promises of 2001: A Space Odyssey, space flight still isn’t a reality for the vast majority of us, and until cheap commercial enterprises exist, we’ll have to be content with the images found in programs like Dream. Happily, it’s a very well-executed project. Narration from Walter Cronkite adds the right level of reverence and spirit, and the pictures themselves are quite breathtaking. Granted, the shots of mission control don’t do much for me, but the movie shows great representations of the astronauts as they work, and we also see some wonderful pictures of Earth taken from space. The Dream Is Alive isn’t the sort of program that opens itself to extended critical discussion, so my comments will be shorter than usual. If you want to see some splendid visuals that demonstrate the majesty of space travel, this is the place to go. I didn’t expect much from the show, but I thought it offered a very compelling look at an experience most of us will never have. The Dream Is Alive appears in an aspect ratio of 1.33:1 on this single-sided, single-layered DVD; due to those dimensions, the image has not been enhanced for 16X9 televisions. Overall, this was a good presentation, though a few concerns kept the picture from becoming excellent. Sharpness seemed to be consistently crisp and detailed throughout the movie. At no point did I discern any signs of softness or fuzziness, as the film remained distinct and accurate at all times. I saw no signs of moiré effects or jagged edges, but some print flaws marred the image. Minor examples of grit and speckles popped up through the film, and it also displayed an oddly wobbly appearance at times. The latter element wasn’t a terrible concern, especially since some instances of this occur on quite a few DVDs. However, I thought Dream seemed to be shakier than most, though this didn’t have a great impact on my enjoyment. Due to the generally monochrome nature of space enterprises, Dream didn’t offer a terribly broad palette, but the colors it featured appeared to be accurate and rich. The hues didn’t really stand out, but they showed no concerns and they always looked fine. Black levels were nicely deep and rich, and shadow detail seemed to be clear and natural for the most part. Some of the shots at mission control were slightly muddy, but as a whole, low-light situations appeared appropriately defined. As a whole, The Dream Is Alive offered a nice visual presentation that made the material quite vivid. Even better was the Dolby Digital 5.1 soundtrack of The Dream Is Alive. The soundfield provided a nicely active and enveloping experience that suited the visuals. Music emanated from all five speakers and became engaging and rich, while effects and speech also pumped from the different channels. Most of the dialogue stayed fairly centered, but sometimes the side and rear channels would enter the act, mainly to give us a feeling of being within an astronaut’s helmet. It was a cool impression that worked well. As for the effects, they mainly tended toward general ambience, but at times they became quite loud. The blast-off sequences weren’t quite as awe-inspiring as the one heard during Apollo 13, but they still provided a solid punch. Audio quality seemed to be very strong. Some speech was crackly and distorted, but that was due to the nature of the transmissions. Actually, even if they could have made the words clearer, it would have been distracting; we expect these radio broadcasts to have that rough, scratchy quality, so more accurate dialogue would feel wrong. In any case, the other speech - such as Cronkite’s narration - seemed to be very warm and natural. Music was brisk and bright, and the score provided reasonable dynamics, while the effects were quite clean and realistic. Those lift-off scenes really blasted the speakers well, as they sounded accurate and powerful. The track lacked any notable distortion, and it offered some deep and rich bass response. Ultimately, The Dream Is Alive provided a fine auditory experience. The only area in which Dream disappoints stems from its supplements, or lack thereof. All we find is a short trailer that advertises the general existence of IMAX DVDs. Many other extras could have appeared, from additional footage to a history of space travel. Unfortunately, Dream remains bare-bones, which is the one factor that works against the disc. The program itself was a winner, as it offered a fine depiction of space travel and gave us many dazzling images. The show moves at a good pace and doesn’t muck itself up with unnecessary dramatics; instead, it simply presents a realistic view of the experience. As for the DVD, the picture looks very good, and the sound was even better. However, $19.98 is a lot of money for a 36-minute program that lacks any extras. As much as I enjoyed The Dream Is Alive, I find it hard to recommend the DVD because it isn’t a very good value. Had Warner Bros. packaged it with another IMAX program, I’d endorse it without hesitation, but as it stands, I can’t do so. If you don’t mind the expense, you should really enjoy The Dream Is Alive, but otherwise it’s simply too costly to merit a purchase.